Employees will take these from the gym to the track, sporting your logo the whole way. Convenient and break-resistant these 16 oz. polycarbonate bottles also come with ringed screwtop to keep from losing the cap. 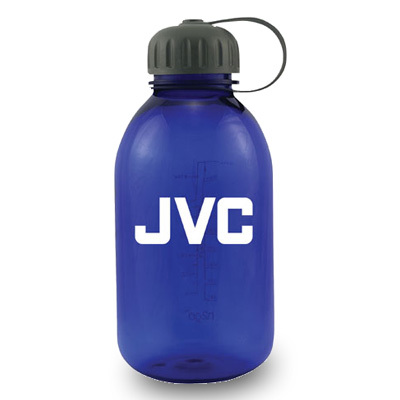 Each bottle includes your custom message or logo imprinted on the side in one color. 8 business days (estimated). Please call for rush orders. Item size: 7-3/8 x 3-1/4. Other sizes and colors are available. Includes one color, one location screenprint. -Set-up charges apply; please call for pricing. - Prices are US$, FOB Factory. Just submit the form at the upper right, or call us at 1-800-233-6690. Item availability and pricing shown on this site are subject to change without notice, so submit your request to ensure current details. We quote each job individually and assign your job to a real live customer service expert. We'll tell you your price, imprinting options and costs, any set-up charges and shipping costs. Decide what you want imprinted. Our staff artists can help prepare it just right. There's no charge for a little touch-up. We'll fax or email you a draft for your approval so you'll see the finished art before we begin producing your items. Tell us where to ship and by what method; make payment with check or creditcard; and approve any final artwork we prepare. Then we'll begin production of your custom items, and monitor the process every step of the way. When your items ship, we'll email you so you can be looking for your packages with your shipping service. Have a question? Just call us 1-800-233-6690 between 8:30 AM and 5:00 PM, EST, Monday- Friday. Since every custom job is unique we quote orders individually. Please submit this form, or call us at our 800#. We'll respond quickly; usually within one business day.